After three seasons, dozens of meticulously evaluated life experiences, and 45 pancakes, Review is coming to a close. 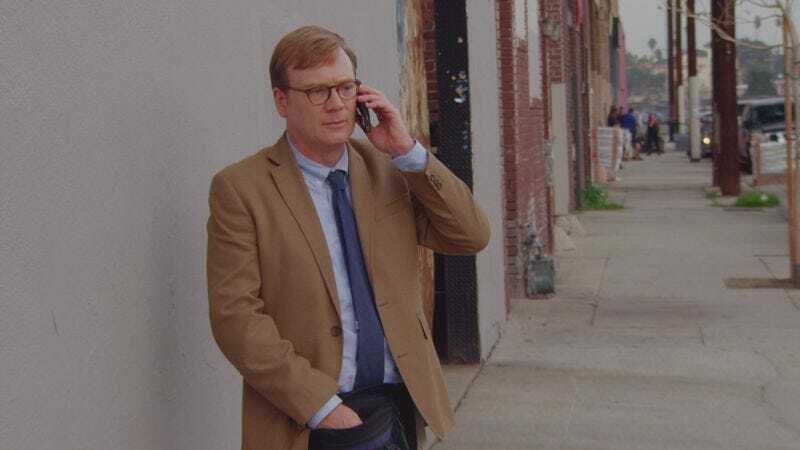 The deliriously black comedy has dragged Forrest MacNeil (Andy Daly, who developed the show along with Jeffrey Blitz and Charlie Siskel) through several dark nights of the soul, ever vigilant in his quest to definitively rank the stuff of life on a five-star scale: such innocuous experiences as stealing (two stars) and being the life of the party (three and a half stars) to trickier subjects such as being a racist (half a star) and killing a person (half a star again—there are no zero-star reviews!). Following the death-defying plunge that capped off season two, the third and final season opens with Forrest still on trial for murder, but otherwise undaunted in the duties only he deems necessary. Ahead of the premiere, The A.V. Club spoke with Daly about why so much time passed between seasons two and three, where Forrest’s last set of reviews might take him, and the sequel to a classic review that never came to be. The A.V. Club: Review wrapped a while ago—what have you been up to in the interim? Andy Daly: I’ve been passively waiting for the next thing, and doing a lot of guest spots here and there. And now it’s pilot season—the network comedies are being cast and I’m reading some scripts and thinking of stuff like that. I have three ideas for three TV shows that are in the “Hey, wouldn’t this be neat?” phase [Laughs. ], which is an early phase of development. I have written a script for an animated show called Dalton Wilcox And The Journeymen. I’m very excited about that. [Laughs.] I don’t know if anybody’s going to want to put it on TV, but boy does it make me laugh. AVC: How do you feel about the way Review comes to a close? AD: I’m very excited about the way that we have concluded the story of Forrest MacNeil and Review. We had a very good idea going into this season and we made it even better by just doing what we always do in the Review writers’ room, which is poking at it from all sides and hearing every idea and sifting through crazy possibilities. I’ve had months to think about it, so I kind of put it out of my mind, and didn’t revisit the episodes for many months—and I just have been revisiting them this week and really laughing. AVC: Why did it take so long for this season to get to air? It’s almost been two years since season two aired. AD: To be blunt about it: I think when a network like Comedy Central has a show that makes tons of money for them, they’re in a real hurry to get it on the air. [Laughs.] So the inverse may be true. After season two aired, there was a real question of, “Can we do more of these?” It was truly one of the most critically acclaimed TV shows of 2014 and 2015, but I don’t think it’s a big money maker for [Comedy Central]. So I think they were in a bit of a quandary, but we figured out a good way to bring it to a close. So that process took a little figuring out, and making the show takes the time it takes. I don’t know why it took so long for them to find a spot on their schedule, but I do believe they found it a very good time to air, and I hope people watch it. AVC: Do you feel like it gets so much critical acclaim because we critics see so much of ourselves—and our own existential crises—in Forrest and his life’s work? AD: I think there may be an element of that. Some critics have pointed out that, among the various things this show does, it really seems to poke holes in the notion of objective criticism. I don’t think anybody could really learn anything from Forrest’s work that they could bring with them into their lives, because his experience is so particular to him and to his various life conditions. There’s nothing universal to extrapolate from any of his experiences. When he tries to evaluate taking a trip on a rowboat, based on his experience, no one else will ever have that experience of taking a trip on a rowboat. [Laughs.] It is not helpful. And I think that some critics have seen that and said, “That’s a worthwhile dig at our profession.” Everybody brings their own backstory and their own prejudices and their own biases to the thing that they’re evaluating. On Review, this is obviously brought to a cartoonish extreme—but it’s an interesting thing to point out. So I think critics have related to that and been tickled at being called out on that. AVC: In selecting the subjects of Forrest’s final reviews, was there a sense of heightened stakes? Like you had to pick the absolute best subjects, because this was it for Review? AD: We did come in feeling that way, but after about a week of pitching our best, most hilarious and crazy ideas, we had a refocusing moment. “This is the end—let’s tell a clear, concise story about Forrest MacNeil and his life versus this show.” It became much more about the story that we wanted to tell across these episodes, and less about the segments. And the segments very much felt like they wanted to feed the story. So they do do that. Having said that, I’m very happy with the segments that we chose. There’s still a box full of index cards with review topics on them [Laughs.] that the world will never get to see! AVC: Can you give an example? AD: [Producer and director] Jeff Blitz just reminded me of one that I can’t believe we’re not going to do it. [Laughs.] But you remember “There All Is Aching”? The way that segment ended, he was actually being asked to review bubble baths. “There All Is Aching” was a misspelling of @TheRealLisaChing, which was the Twitter handle of the person asking for the review of bubble baths. So the thought was, for season three, somebody was going to say “I was so sorry to see that you didn’t get the chance to review bubble baths. Will you please review bubble baths” [Laughs.] and then somehow or other, it was going to end with Forrest back in the mental hospital with Emo Philips and Rich Fulcher. The idea being that it was predetermined from the start. That was always going to end there. AVC: “Predetermined” is a fitting word for Review—sometimes it feels like Forrest is trapped in somebody else’s plan. Do you see Forrest as sort of a Job-like figure? AD: I’m scared of saying too much, but I will say we talked a lot about Job in our writers’ room. And certainly did in the making of this season. We do feel that Forrest is, perhaps, being tested [Laughs.] at all times, and it’s fair to say he’s pretty much failed consistently. AVC: What were some of the advantages and disadvantages to working with a shortened episode order? AD: Advantage-wise, it was good to zero in on a very concise, specific story, and make sure that everything, in one way or another, was helping to tell that one story. But it was mostly a challenge, to tell you the truth. At some point, I added up the number of screen minutes that we were going to have, and felt like, “Oh, this is not a lot.” It made for a lot of hard choices, and it made for more saying “no” than we had usually done in our writers’ room. But I think in the end it ended up being a good thing for us, to be able to laser-focus on a very specific story and make sure that every part of it is fun and helpful to telling that story.